"There will be a Nissan product in Japan, which will carry autonomous drive," Nissan CEO Carlos Ghosn told reporters at the New York International Auto Show on Thursday. "Obviously when you have this kind of technology, you want also the Japanese market to enjoy it as soon as possible." Also this week, auto parts supplier Delphi announced its autonomous Audi completed a 3,500-mile, cross-country journey. The Audi traveled from San Francisco to New York in the first coast-to-coast trip ever taken by an automated vehicle. 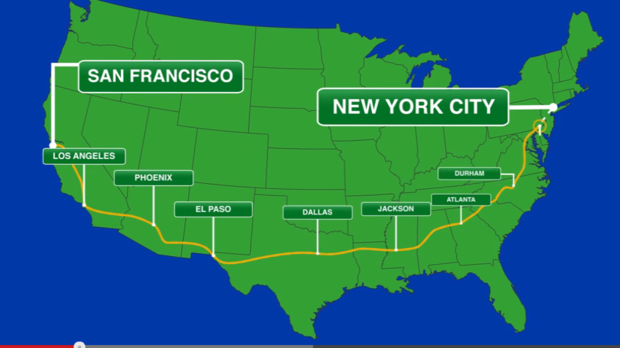 The nine-day trip crossed 15 states and the District of Columbia, passing through complex driving situations such as traffic circles, construction zones, bridges, tunnels, aggressive drivers and a variety of weather conditions. Yet, 99% of the drive was completed in fully automated mode. "Our vehicle performed remarkably well during this drive, exceeding our expectations," Jeff Owens, Delphi chief technology officer, said in a statement. "The knowledge obtained from this trip will help optimize our existing active safety products and accelerate our future product development, which will allow us to deliver unsurpassed automotive grade technologies to our customers." The route Delphi's Audi took across America. Delphi said its automated driving vehicle is equipped with advanced technologies, many of which are already on the market, including collision mitigation, integrated radar and camera systems, forward collision and lane departure warning. Delphi engineers use the drive to collect information that will help further advance active safety technology. The research team said it collected nearly 3TB of data. Meanwhile, Nissan has partnered with NASA to develop autonomous vehicle systems. The five-year research and development partnership between Nissan's U.S. Silicon Valley Research Center and NASA's Ames Research Center at Moffett Field, Calif., will also focus on human-machine interface technology, network-enabled applications, and software analysis and verification, all involving sophisticated hardware and software used in road and space applications. "The partnership will accelerate Nissan's development of safe, secure and reliable autonomous drive technology that we will progressively introduce to consumers beginning in 2016 up to 2020," Chosn said in a statement. In 2016, Nissan believes its vehicles will use lane guidance systems and adaptive cruise control to automatically steer and brake on highways. In 2018, Nissan vehicles should have the ability to change lanes and avoid obstructions and other hazards in the roadway. By 2020, vehicles should be able to navigate themselves through congested city streets, according to published reports. Nissan has set 2020 as the timeframe for the introduction of autonomous drive vehicles that have the ability to navigate in nearly all situations, including the most complex situation, city driving. Besides the technical speed bumps to innovating more autonomous vehicles, Ghosn cited legal issues, such as who would be responsible for motor vehicle accidents that occur and how regulators would address self-driving systems. "It's going to happen step by step, because we need to make sure that the regulators in the different countries feel comfortable," Ghosn told Kyodo News. "To persuade the regulators that you can take your hands off the wheel or your eyes from the road is going to take a lot of demonstration," he added.